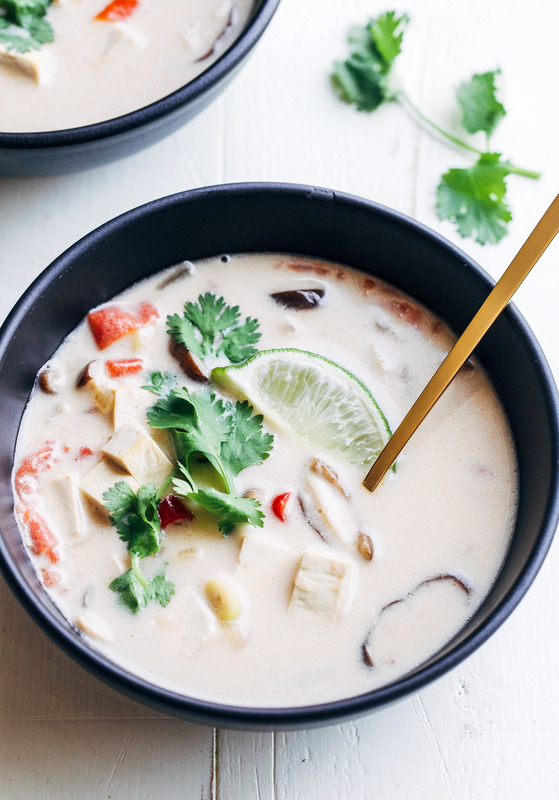 Vegan Tom Kaa Gai- classic Thai coconut milk soup made with cubed tofu in place of chicken. It’s creamy, comforting, and takes just 30 minutes to make! One of my favorite memories from our trip to Thailand was the day we spent at the Thai Farm Cooking School. It was our last day in Chiang Mai and I was starting to feel a little run down. But I was so excited about the cooking class, there was no way I was going to let myself miss it. So I popped a few Advil and did my best to power through a full day in an outdoor kitchen preparing authentic Thai food. The first thing on the menu was this coconut milk soup and after one spoonful, I instantly fell in love. It must have been 100 degrees with 98% humidity that day but I didn’t care. It tasted so good and offered comfort for my sore throat in the best way possible. 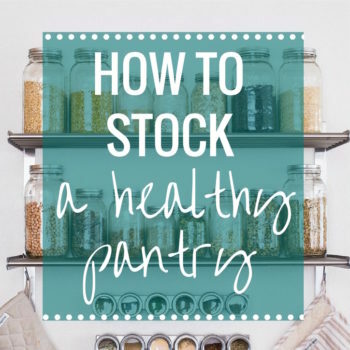 At first I was intimated by the long and somewhat complex ingredient list but as it turns out, it’s very easy to prepare and it comes together quite fast. Once you have everything chopped and ready to go, it only takes 15 minutes to cook. Part of that is because we’re not using chicken like the classic recipe calls for. There’s no waiting to make sure your raw meat is cooked through…as long as the tofu is warm that’s all that matters. Our teacher, Garnet, explained to us that authentic Thai food encompasses four flavors: sour, sweet, creamy and salty. Plus a little heat, of course. This soup does a magnificent job allowing all of those components to shine through. 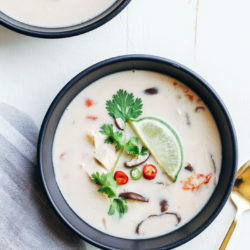 The lemon grass and lime lends the sour; the coconut milk offers a light creamy texture with a hint of sweetness; and the tamari gives it a savory saltiness. The whole combination makes for one seriously delicious soup. Tom Kaa Gai is typically made with galangal root but I was unable to find it here in the states so I chose to omit that from the recipe. I also left out adding coconut sugar because I find it to be sweet enough on it’s own but feel free to add a teaspoon if you desire a sweeter flavor. Also, if you can’t find bird’s eye chilis or kaffir lime leaves (I was able to find them at my local Asian market), you can substitute jalapeños and add a little more lime juice. I prefer to use 3 chilis for medium heat but feel free to adjust that to your liking! In a large pot, combine the lemongrass, mushrooms, shallot, kaffir lime leaves and water then bring to a boil. Add the chilis, tomato, tofu and coconut milk. Season with tamari and a large pinch of salt, stir together, then allow to cook for about 5 minutes. Remove the pot from the head then stir in the lime juice. Taste test to see if you prefer more salt and add as needed. It should taste creamy, salty and a little sour. Serve warm with fresh cilantro and enjoy! *Three bird’s eye chilies gives this soup a mild-to-medium heat. If you are sensitive to spicy foods you might want to try starting with one and going from there to see how you like it. You can also substitute jalapeño or serrano peppers if you can’t find Thai chilies. **Substitute with extra lime juice if you are unable to find kaffir lime leaves. The flavor won’t be as authentic but it will still taste good. Gaaaaaah I need to attend an authentic Thai cooking class! It sounds like you had the most memorable, valuable and tasty experiences! 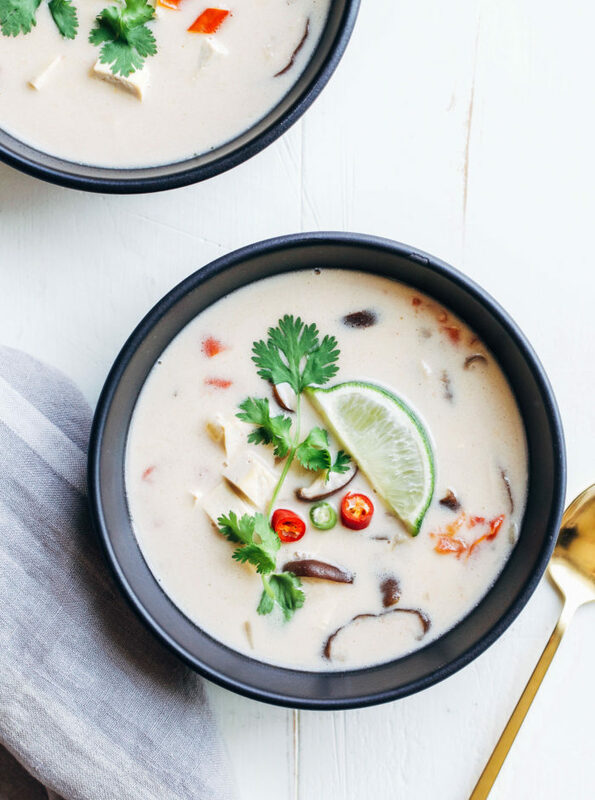 Thai coconut soup is seriously one of my favorite dishes of all time. I like making mine with either shrimp or chicken, or both, but am 2000% up for this tofu version…I can taste the sour, sweet, creamy and salty flavors already! With fall quickly coming up, I have been getting SO pumped for warm soups. This looks so comforting, fresh, and just plain pretty. Love it. That’s all I’ve been eating lately is soup, lol! 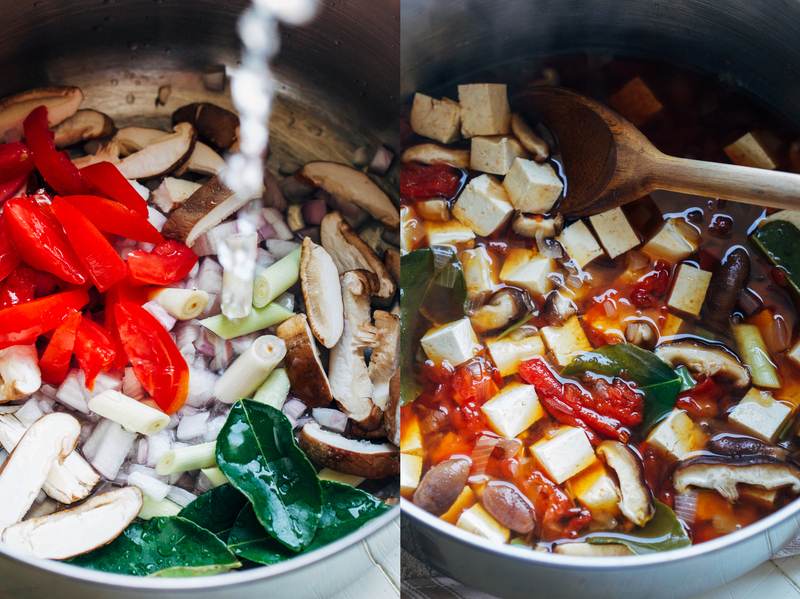 I might need to change it up so that I don’t overload my site with soup recipes. This sounds fantastic and has totally simplified what I thought would be a very complicated recipe! That must have been awesome taking a cook class in Thailand. This looks so good! Between the coconut milk and the mushrooms I’m pretty sure I would love this. I need to take a cooking class! 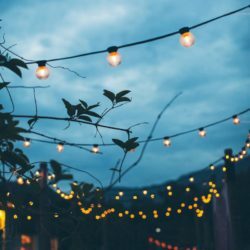 It is such a fun way to experience the local culture and food! You appreciate the meal so much more being able to see the fresh ingredients that go into it and learning about how they compliment each other. I highly recommend it! My local Whole Foods always carries lemongrass but I was surprised to find kaffir leaves! That’s the trouble of cooking authentic Asian cuisine. Their ingredients are so different from our due to geographical location. This is an amazing and simple recipe that tastes complex and authentic. I didn’t even have the keffir limes, or the peppers and substituted lime juice and seranno and jalepenos and the tastes are still delectable. I added some more veggies to mine to make it more like a stew, and I served it over rice. Thank you for sharing this goodness on pinterest. 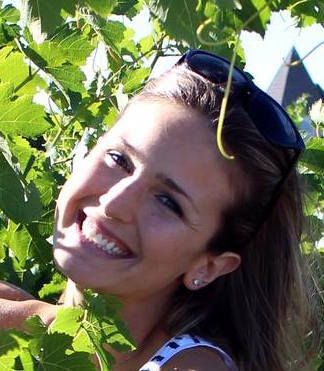 I’m so glad it turned out well for you, Rebecca! I love the idea to make it like a stew. Sounds delicious. Thanks for the feedback! If we do have access to galangal root, how would we incorporate that into the recipe? Thanks! Thank you for this wonderful recipe! This was the perfect thing to eat while sick and the flavor came very close to what I have had in restaurants. I found all the ingredients at Whole Foods including galangal. Next time I will add fewer tomatoes and shallots and sub with baby corn and maybe bamboo. I’m so happy you enjoyed it! Baby corn and bamboo sound like delicious additions. Thank you for the feedback! This was fantastic! Simple, delicious and comforting. I’ve made it twice in one week. I like this better than the chicken version! The chicken loses its taste. Next time I will add more liquid- maybe equal ratios of water and coconut milk. I just loooove the broth. Way too much lime. Not sure what happened but I would add like a third the lime this calls for. The recipe doesn’t call for lime. It calls for 4 kaffir lime leaves. “like a third” of that would be 1 1/3 leaves. Is this really what you mean, or did you mistakenly put actual limes in?? I tried this out last night, and its so tasty!!! 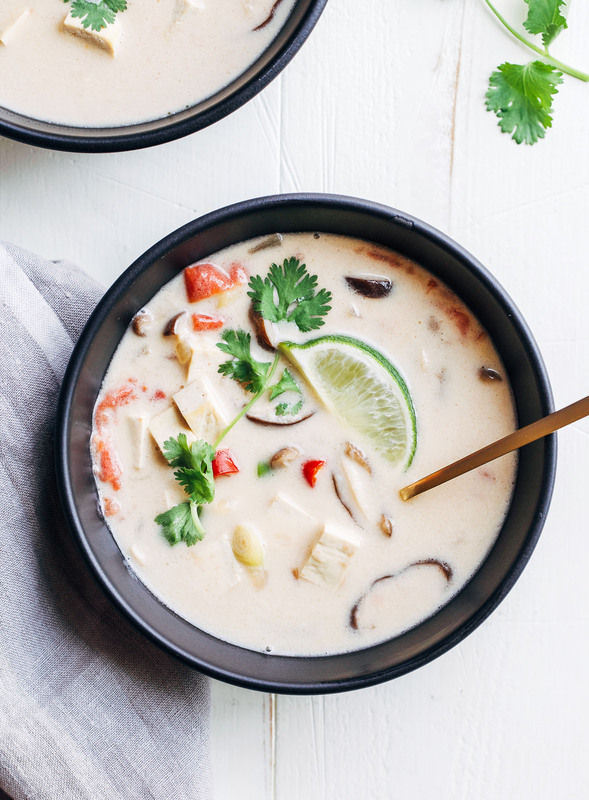 So creamy and Tom Kha in general just warms the soul. Found it on Pintrest, thank you for sharing! Some notes for next time I make this: The stalks of the mushrooms didn’t cook through so I think next time I’ll cut them off, and i put 2 peppers (I had the authentic Thai peppers) and it was a tad too hot. As a beginner next time I will make it with one and go from there. Thank you!! I was concerned about what looked like not a lot of liquid but it turned out really well! How much water to begin with in the pot? So excited to try this . Thank you ! The recipe doesn’t call for water. Just coconut milk! This soup needed a little ginger & bay leaves while cooking to make actual Tom Kaa Gai. Without that extra flavoring you taste too much sweet coconut and lose the authentic blend of sweet and sour. I also added s splash more Tamari. 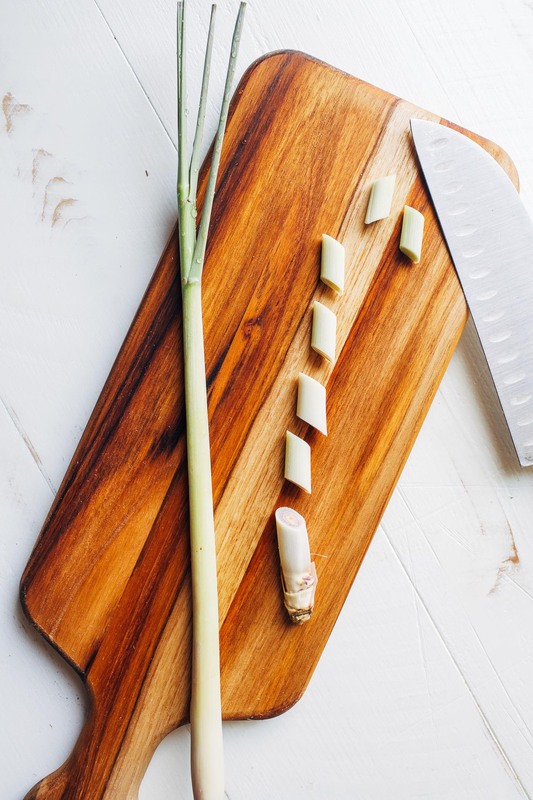 A big tip is to peel the first layer of lemon grass so it enhances the flavor. As serious Thai food eaters this tasted great with my alterations. I doubled the recipe and it was just perfect! The lime is necessary. Make sure to shake coconut milk before opening. Very impressed with this soup! Yum. 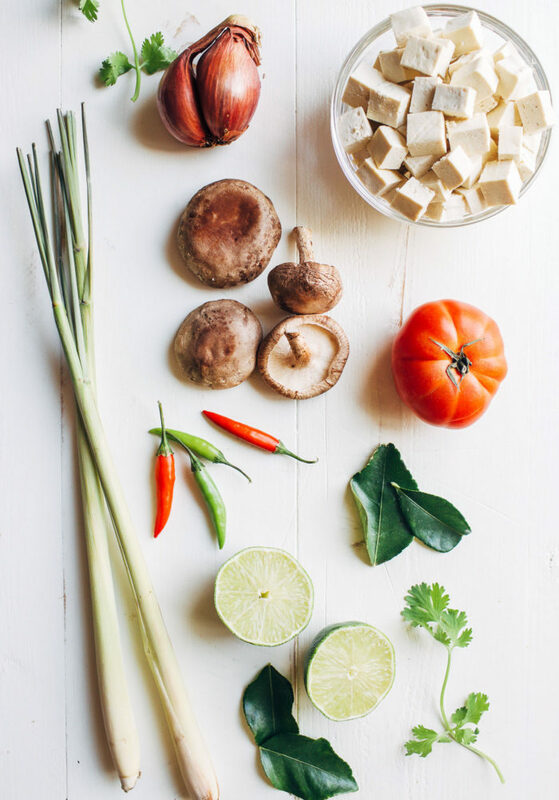 Real traditional Tom Kha contains galangal, which is somewhat similar to ginger. It’s one of the core ingredients and I wonder whether the author of this blog made a mistake in not including it in this recipes. Hi Cynthia, if you read the post I stated that I wasn’t able to find galangal at my local Asian store and especially not the regular grocery store. Because of that I chose to leave it out as most Americans will likely struggle to find this ingredient. Thank you for the input though! I tried this recipe for the first time today and I’ll be making it again tomorrow! Since going vegan I’ve been craving creamy soups and pastas so bad and this soup was perfect! 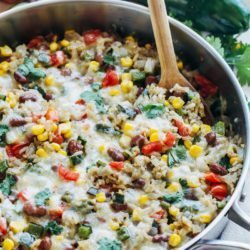 I tried it for the first time in a restaurant last month and this recipe came out better than that! 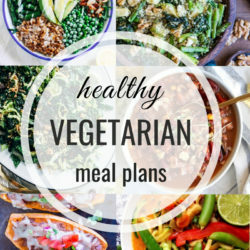 I made some changes, didn’t have the lime leaves so I substituted more lime juice and it was good, I also put ginger and bay leaf in, as well as about every veggie I had in my fridge including corn, broccoli, snap peas and peppers and it was beyond amazing. Oh! And I replaced the half cup of water with a low salt veggie broth. My non vegan boyfriend approves too! 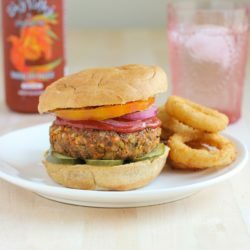 Love the vegan idea of this recipe. imo it needs less lemongrass though to get closer to the real tom kha kai taste. for the rest of it, loved it. I’m not sure if lemon grass is hard to find in a regular grocery store like Publix but it seems like a key ingredient. I can’t wait to try this recipe! I usually don’t have a hard time finding it. Galangal is super hard to find though! If I had a juicer I would juice my lemongrass and a portion of my galanga and maybe a few of the limes leaves only leaving a sliver of lemongrass and a leaf of a few to show that it’s there. Otherwise I make a stock with the lemongrass and leaves and I try to do half juice half solid lime pieces for galanga or ginger. I love this soup, I rarely make it because the ingredients are pricey where I live. You can definitely use water to control creaminess. Water is an ingredient in coconut milk so sometimes canned coconut milk will be more or less watery even. Great recipe… a showstopper for my vegan friends. (As others have commented, you can substitute ginger for galanga, it’s basically the same and easier to find). Thanks for sharing this. After near starvation (I am a vegetarian and can’t eat meat, seafood or egg based dishes) I had dinner at a restaurant in Bangkok with vegetarian and vegan items in their menu. The food was stunning to say the least. 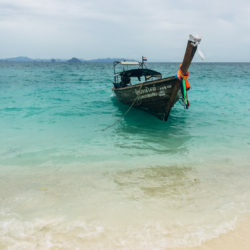 First time I had the coconut milk soup there and I have been looking for an authentic recipe. It looks like I have found it here! One question though. 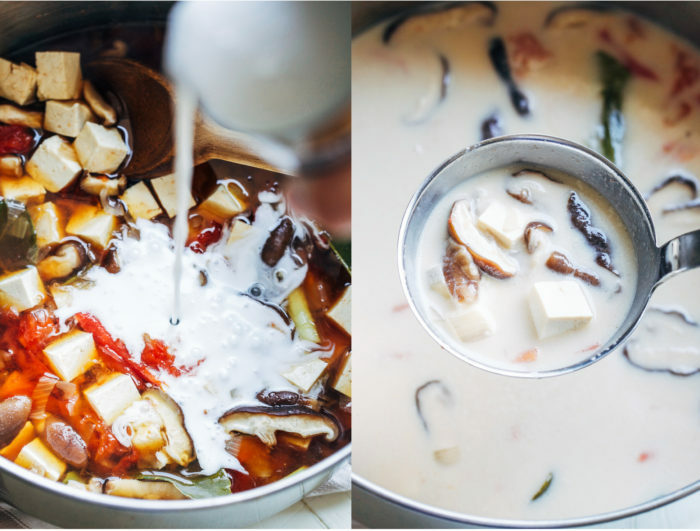 1/2 cup of water and a can of coconut milk can yield 4 bowls of soup? Also, I have dried galangal in my pantry (whole and powdered). How do I use it for this soup? I got fresh kaffir lime leaves from Amazon shipped right to my home! It actually makes 4 cups of soup which is about 2 large bowls. I haven’t used dried galangal so I’m not sure how to advise you on that one. Perhaps you can experiment and see how it goes! This was amazing!! So much flavor. I was able to find galangal too and added about 1.5 inches sliced up. My only regret is that I didn’t whip up a double batch! I served it over brown rice with green beans. Thank you! Thanks for the review, Elizabeth! I’m so glad you enjoyed it! I subbed “Thai Home” mussaman curry paste for the chilis (since that’s what I had on hand) and added a spoonful of minced ginger (based on reviews) and it tasted great! I’m not sure how it should taste with all of the ‘correct’ ingredients, but with the subs it was pretty tasty. I loved how easy and fast this recipe comes together. Silly questions though: is the lemongrass just for flavor? Do I remove before serving? Yes the lemongrass is just for flavor. You can finely chop it or leave it in large pieces and remove after cooking.